The following article was originally printed in Everyday with Practical Electronics magazine (see the fine print below). A very special thanks goes out to Alan Winstanley (email: alan@epemag.demon.co.uk) for securing the proper rights so we could place this article on ThereminWorld. 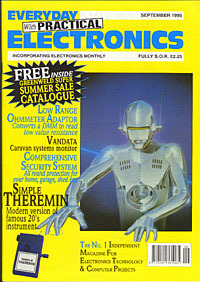 Be sure to check out the November, 1996 issue for another theremin design!! Simple Theremin Project designed by Jake Rothman, reproduced from Everyday Practical Electronics magazine (ISSN 0262 3617), Vol. 24 No. 9, Sept. 1995 issue, with the express permission of Wimborne Publishing Ltd., Wimborne, Dorset, United Kingdom. (C) Copyright Wimborne Publishing Ltd. 1995. Copyright in all drawings, photographs and articles ublished in Everyday Practical Electronics is fully protected, and reproduction or imitations in whole or in part are expressly forbidden. The Simple Theremin is available by MAIL ORDER ONLY (NO PERSONAL CALLERS) in kit form and ready-built, from Rosedene Audio, Dept. EPE, 23 Ashley Lane, Hordle, Lymington, Hants. SO41 0GB, United Kingdom. Phone ( 44) (0)1425 610849. The following files make up the article. If you wish to purchase an original copy of the issue this article appeared in, contact EPE Magazine (link above) for back-issue information. You may have to hold down the shift key while you click to download the images instead of viewing them.